I went to the SPECTACULAR show at The Detroit Opera House on June 10th, 2015 and here are some professional photos of the show. As you know, nobody was allowed to take photos or videos... it's extremely unfortunate too because a picture is a picture... does it matter if a professional took a photo or a fan? And I also got front row and John spoke to me and touched my hand three times... and I have no memory of it except these photos, which were taken way before that. (I know this because when he touched me, his jacket was off.) 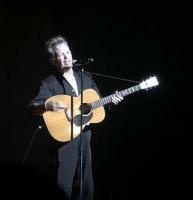 So unfortunetly, these are the only memories I will ever have of this very special John Mellencamp concert. I kinda hate the Detroit Opera House now. This just pisses me off that I can't just get a video or two... My memory is horrific already due to my ADD (Attention Deficit Disorder). But anyway, I won't complain anymore because at least I got to go. And we shared smiled together. And he winked at me 10+ times. And I touched his gentle hands so much and he spoke to me, looking right into each other's bringht blue eyes... gosh, I'm falling in love with him SO BADLY. To bad I'm only 16. Thanks for the links, I agree that it is sad you cannot take a few pics for memories sake of an event you pay big bucks to. I am so sorry you did not get to take any photos. What a bummer for you since I know how important he is to you and the moment.